From getting a fresh cup of coffee to grabbing a Traders’ Greens salad, here is your quick guide to new and revamped locations for Fall 2017. A European-inspired dining location that serves deluxe coffee, pastries and unique sandwiches. The coffee served is from Crimson Cup Coffee and Tea Roasters in Columbus, Ohio. Crimson Cup was recently just ranked within the Top 25 Roasters in America. 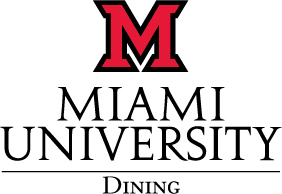 Dining is excited to partner with this local, award-winning company to serve the campus. Try this new location for a quick meal and caffeine pick-me-up. Enter by way of repurposed flooring from the Withrow basketball courts and immerse yourself in Miami sports history while enjoying classic arena foods. Red Zone is rich with history and pays homage to the beloved sports culture here at Miami. This casual dining eatery has pool tables, foosball, TVs, and a laid back environment to break up your typical eating routine. Try one of the many hot dog combinations or the delicious Smokehouse Mac & Cheese sandwich and you’ll fall in love with Red Zone. The Toasted Bagel (formally Traditions) will serve— you guessed it— bagels! The menu features bagel sandwiches, plain bagels, breakfast bagels, and the ever-popular Traders’ Greens salad bar. Their signature dessert, The Toasted Bagel, is your choice of bagel toasted with butter, cinnamon and sugar then sprinkled with powdered sugar – Tuffy’s Toasted Roll style! Maple Grill, formerly Encounter, boasts an expanded menu including quesadillas and quinoa bowls, formerly from Americas. An all-new buffet-style location with a variety of delicious options to try. Stop by and visit this new addition to campus! Formerly Tea Hive, this is a quick and convenient stop for a snack on the western side of campus. With a selection of sushi, egg sandwiches, muffins, hot or cold drinks, Western Express will surely have the variety so you can quickly get what you’re looking for. Don’t forget about the Faculty/Staff discount at all buffet-style, commons locations. We’ll see you at lunch for $8!